Ack! It's the end of June already? Where did the time go? 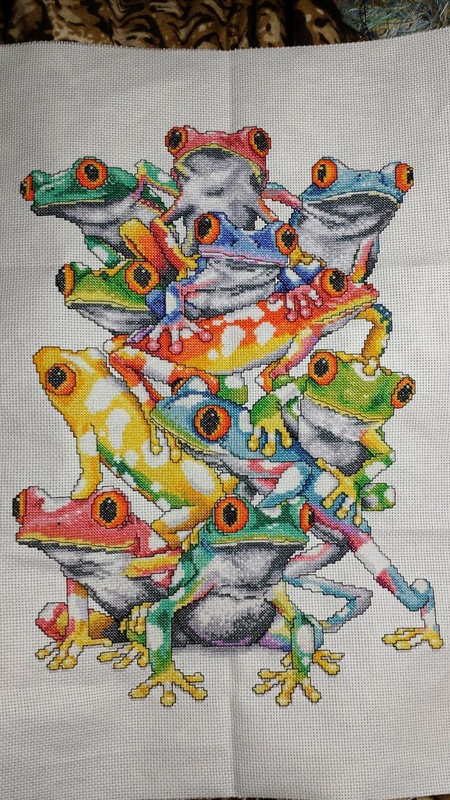 This month was split between Frog Pile, which I did finish. And various crochet projects with some needlepoint and a latch hook thrown in for good measure. And of course, stash accumulation of mostly yarns. But I did break down and get some cross-stitch stash. I passed up several kits that had caught my attention while in Joann's but these I couldn't. I spent a lot of time perusing ravelry this month. I did a little more craft bouncing this week. I picked up something I hadn't worked on in years. A latch hook. 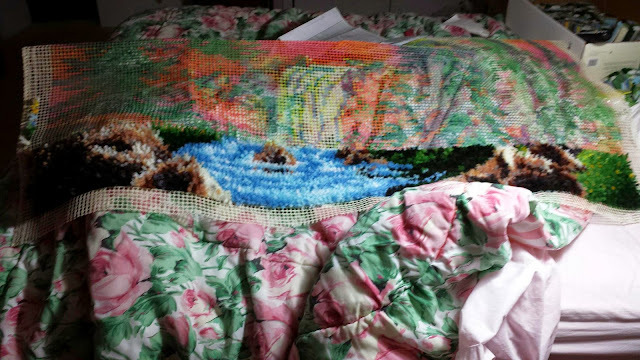 A really big latch hook. As you can see, it takes up nearly the length of my bed. I also caved and went back to my cross-stitch for a bit and put about 10 more rows in on Black Stallion. As it still just looks like a purple rectangle, I didn't take a picture of it. Tuesday, I got a comission for a baby blanket. 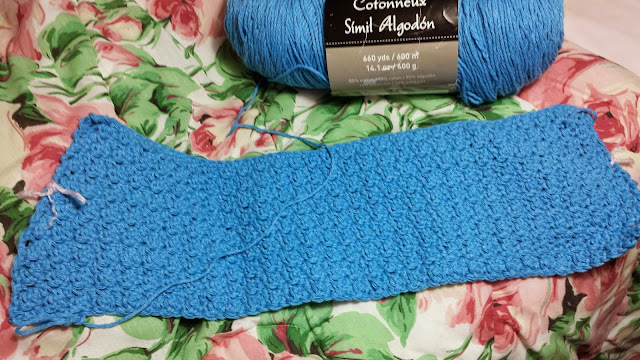 So I bought yarn and have been making lots of squares. At the time of this posting I have made 39/48. Of course, getting yarn meant I went to a craft store, which meant I came home with more than I should've. Although, I didn't come home with nearly as much as my list of possibilities due to lack of yarn in a color or two for the entire project. I did however, buy yarn to make placemats and several more ruffle yarn colors I hadn't seen before. And then there are the magazines/books I picked up. What did I work on this week? It's more like what didn't I work on. I started a lot of crochet projects, but none could really keep my attention. Two shawls (the brown I'm unhappy with the drape. By the way, that's an E hook). I additionally bought more yarn stash. I local yarn store is closing at the end of the month and I took advantage of their 50% off sale. Most of this is cotton. The green is a superwash wool blend and the orange/brown is merino. I'm going to see if this is the one wool I'm not allergic to. It's also where I got the e-reader case. 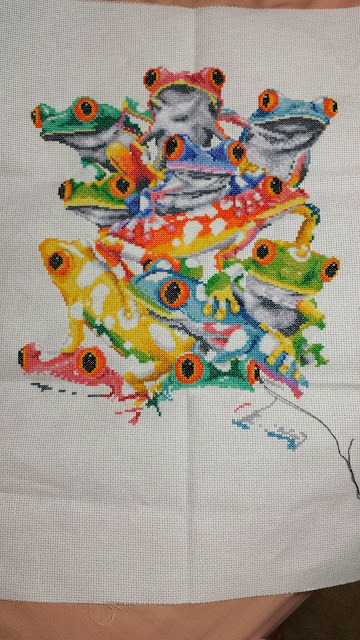 I finished frog pile! Here's a pictures without backstitching. And one with backstitching and a few french knots. I'm going to do a bit of crochet for a while. Build up my inventory for my Etsy page. 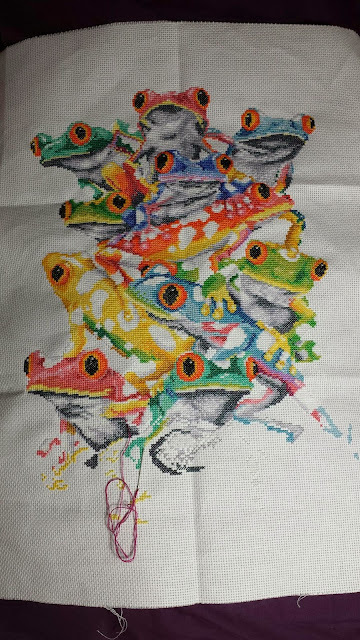 My current progress on my frogs. Several things happened this week. Tuesday, my phone dropped onto the driveway, landing screen down and it cracked. I need to find a place to replace it. Thankfully everything else on the phone is functional. My rosebush is in bloom. A bit later than usual this year due to the weather. And finally, my partner and I participated in a competition yesterday. We got a 3rd and a 2nd in the Samba, Cha Cha, Rumba rounds and won both Jive contests. 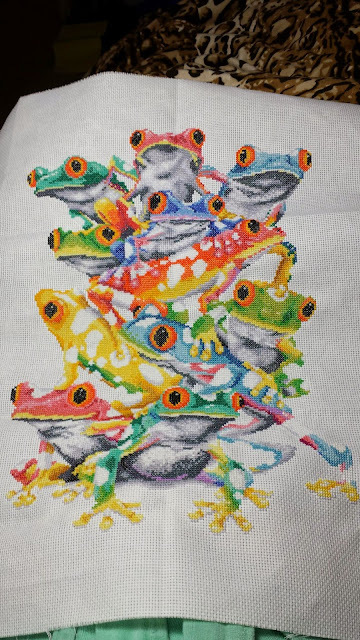 All 11 frogs have been started. I'm getting close to finishing all of the stitches. Then to backstitch. I also had to buy a new Daylight lamp this week. I had two of the same design I bought about 10 years ago. One I kept at home, the other in my dorm room. The same thing happened to both, the foot switch stopped working from use. There was a loose connection so I opened the housing, but after I put it together again, it would take several tries to get it to switch on again. Lately, it got even more tedious to turn it on. I even exposed the actual switch the past few days but could feel it was dying. So, I bought the latest version. The old lamp is in front, the newer one is the one in back. I'm happy to announce the switch is a normal lamp switch and not a foot switch. Additionally, the height of the lampshade is adjustable. I am not happy about the new length and placement of the pattern holder and magnifying glass.